In a bid to impart technical education in a bigger way, the State Government on Monday signed MoUs with nine mega industries, which would set up Industrial Training Centres (ITCs) in different parts of the State. The industries interested in setting up ITCs are the Odisha Power Generation Corporation (OPGC), Tata Powers Company, Vedanta Sterlite Energy, Emami Paper Mills, RSB Metaltech, Surendra Mining Industries, Monnet Power Company, Uttam Utkal Steels and Ind-Barath Energy (Utkal). 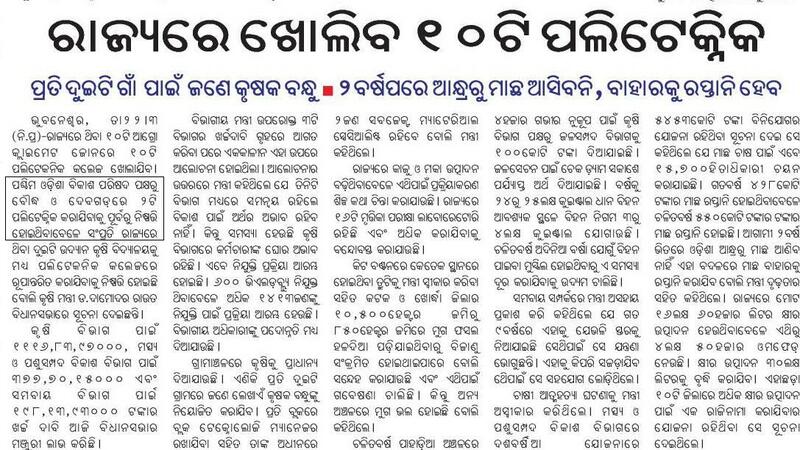 The OPGC would set up an ITC at Hemgiri in Sundargarh district, Tata Powers at Banki, Cuttack, Vedanta at Kolabira, Jharsuguda, Emami at Balgopalpur, Balasore, RSB at Kalyansinghpur, Rayagada, Surendra Mining at Bonei, Sundargarh, Monnet Power at Teleibani, Deogarh, Uttam Utkal at Jhumpura, Keonjhar, and Ind-Harath Enery at Lakhanpur. The MoUs were signed between Director of Technical Education and Training Anil Samal and the MDs and GMs of companies concerned in the presence of Chief Minister Naveen Patnaik, Steel and Mines Minister Raghunath Mohanty, Chief Secretary TK Mishra, APC RN Senapati, Industries Secretary Sourav Garg, Energy Secretary Pradeep Jena and IDCO chairman Priyabrata Pattnayak. The Chief Minister said that as the setting up of different industries is on the rise, skilled manpower is needed in proportion to their number. “Our Government is fully committed to set up ITIs and ITCs in all blocks to impart technical education to our youth,” he said. Steel and Mines Minister Mohanty said there is an annual requirement of nearly 1,80,000 trained personnel in highly-skilled, semi-skilled, unskilled and non-executive workforce in the metal and manufacturing sectors. BHUBANESWAR: Orissa government has sought an assistance of Rs. 1116 crore from Planning Commission to set up one Industrial Training Centre [ITC] each in 186 blocks in 18 Maoist affected districts. The state government believes that setting up the ITCs will not only help build a vast pool of skilled manpower required for industries coming up across the state but also woo the youths fro the remote areas being inducted into Red Brigade. The state requires more than three lakh semi-skilled manpower with industries coming up in various sectors. Only steel sector can absorb about 1.8 lakh skilled, semi-skilled and non-skilled manpower every year. The mining sector requires 1.2 lakh trained personnel. Besides, the employment intensive tourism sector and the information technology have a demand for more than 12,000 trained youths each while the growing energy sector has a demand for some 3000 skilled people. The state government also belatedly has found out that more and more skill imparting centres had to be set up in the remote areas to foil the Maoists attempt to recruit the hungry unemployed youths into the Red Brigade. The state government’s move to set up ITCs in these Naxal dominated districts could be a good beginning in this regards, experts said. In the first phase, the union government granted 91 ITIs and 415 skill development centres in the state with public-private partnership (PPP) model .The state government is also settwhere such institutions are conspicuous by their absence. As part of its policy to encourage the industrial hosues to set up ITCs, the state government on Monday signed MoUs with nine companies to set up ITCs. BHUBANESWAR: Anticipating huge demand for skilled manpower in view of the rapid industrialisation underway, the Government today decided to open industrial training institutes (ITIs) in all the blocks of the State by 2012. A high-level meeting chaired by Chief Minister Naveen Patnaik also decided to introduce a special stipendiary scheme to encourage Bonda youths to join industrial training programmes. The decision was taken after the meeting was informed that tribal students of Malkangiri district are showing interest in such training and their enrolment in the Government ITI, opened in the district last year, is increasing. It was also decided to increase the monthly stipend of poor and meritorious students from Rs 50 to Rs 500 and fill up all the vacant teacher posts on contractual basis. A technician entrance test (TET) will be introduced for selection of students for the Government ITIs. Two newly opened Government ITIs at Rayagada and Sonepur have started functioning from the current academic year while the Plumber Training Institute operating at Cuttack will be shifted to its new campus at Pattamundai, the meeting was told. The Ministry of Labour and Employment has sanctioned 91 new ITIs under public private partnership (PPP) mode, the State Government has sought Rs 828 crore from the Centre for establishment of 186 new ITIs in the extremist-affected areas. While private promoters will take the lead role for establishing the training institutes under the PPP mode, the State Government will provide land free of cost. Other infrastructure facilities like road connectivity, supply of water and electricity will be the responsibility of the Centre. However, the Central support will be through viability gap funding. So far, 27 industries had shown interest to set up ITIs in the State and memoranda of understanding (MoU) will be signed with 10 industries, including the State-owned Orissa Mining Corporation (OMC). Global steel major Arcellor Mittal has also proposed to set up a centre of excellence in Keonjhar district where the company planned to establish a 12-million t o n n e g r e e n f i e l d s t e e l project. The Chief Minister directed to conduct credit rating of all the ITIs by an independent agency to ensure quality training. He also emphasised on introduction of new trades having demand in the market. Chief Secretary TK Mishra, Agriculture Production Commissioner RN Senapati, Industries Secretary Sourav Garg and other senior officers of the Industries Department were present. Twenty two government run polytechnics would come up in as many districts of Orissa in 2010-11. These polytechnics would come up in those districts which are not yet served by the government polytechnics. The districts include Boudh Gajapati, Nabarangpur, Bolangir, Kalahandi, Koraput, Kandhamal, Mayurbhanj and Balasore to name a few. The Ministry of Human Resource Development and the Department of Higher Education of the Government of India has sanctioned Rs 12.3 crore for each polytechnic. The amount for the proposed polytechnics would be released in installments under the Scheme of Submission on Polytechnics under Coordinated Action for Skill Development. It may be noted that 13 government engineering schools and polytechnics are already functioning in Orissa under the state industries department. The Orissa government has already agreed in principle for the establishment of these 22 polytechnics. A single patch of land spread over 10 acres has already been identified by the state government in each of the districts. Out of Rs 12.3 crore sanctioned for each polytechnic, Rs eight crore will be spent on civil works and Rs 4.3 crore will be spent on equipment, machinery, furniture and learning resource material. With the opening of these 22 polytechnics, every district in the state will have at least government polytechnic providing quality education.